No change in application itself. Application can now be compiled for PIC18F4620 as well. In patch mode, each BankStick contains only one bank configuration (means: pot/button/label setup), but 128 snapshots! This allows you to prepare one configuration for your MIDI gear, and to store/recall/morph up to 128 scenes. experimental support for drum triggers - driver needs some improvements! 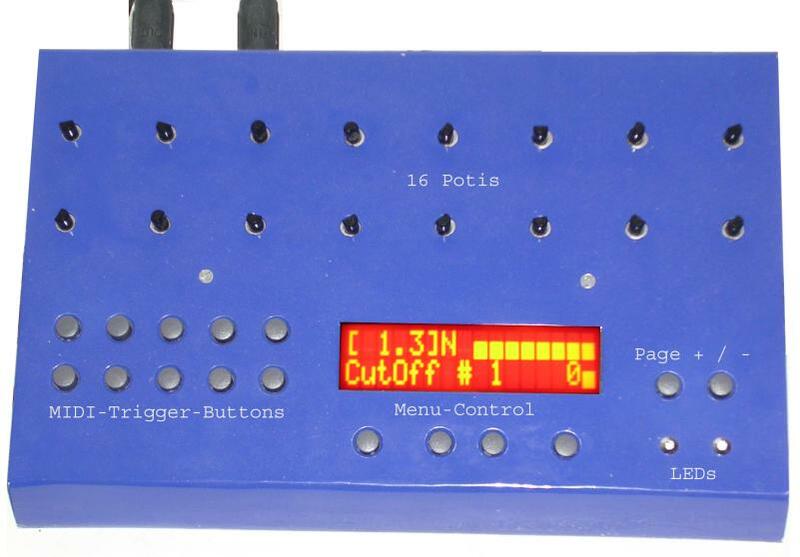 Matthias Schreiber has integrated a Page-Mode for MIDIBoxes with only 16 pots. Using the SF-Buttons you are able to switch between pots 1-16; 17-32; 33-48; 49-64 in the same bank. So 64 pot-events could be used per bank instead of only 16.
the complete MIDIbox64 firmware has been ported to MIOS and is now running on a PIC18F452. For new projects it's recommended to switch to the PIC18F452 because of the higher flexibility, but also the update of an existing MIDIbox to MIOS makes sense due to the new features - just only the processor and the crystal have to be changed. V2.0 is almost compatible to the PIC16F firmware, only the dynamic jitter filter is not available anymore (not required, MIOS works internally with 10bit resolution) and the 4-line LCD flag has been replaced by the possibility to freely customize the screen (see cs_m_display.inc), so that any kind of LCD which is supported by MIOS can be adapted to this firmware. Note that Serge's vmidibox64 editor (which has been developed for the PIC16F version) can also interact with the new implementation. The transfer rate has to be set to a value less than 150, otherwise the dump won't be received completely. This isn't a bug in MIOS, but a problem related to the PIC18F which can only save 64 bytes at once in the internal flash memory (the PIC16F saves 2 bytes (14 bit) at once). New SysEx command "Switch Bank" allows to change a bank via MIDI (see also midibox64_sysex_implementation.txt). It will be used by one of the next releases of Serge's editor to access all banks via remote. The feature could also be usefull in conjunction with sequencer software like Logic Audio to switch to a bank depending on the selected Song, Window, VST PlugIn (as far as the software supports such an automization). New SysEx command "Partial Write" allows to write quickly into particular memory locations (see also midibox64_sysex_implementation.txt). It's a feature especially for the editor. Optimization for MIDI controllable LEDs to ensure that no MIDI data get lost when the MIDIbox receives a continuous MIDI stream. Restriction: only the MIDI event assignments which are embedded in the internal bank will be taken into account for the LEDs. Addresses of the special functions for increment/decrement bank have been changed to match with the MIDIbox16E format. Note: a complete setup file for Serge's Editor can now be found here. An additional firmware has been created for the MIDIbox Hardware Platform with a different pot addressing scheme which simplifies the wiring. Faster automatic button repeat mechanism for the menu buttons. The mk_syx script comes with some special examples for SFB (midibox64_sfb.ini) and the Sequencer (midibox64_seq*.ini). More Special Functions will be available in future. Button Debouncing now independent from number of pots - you will notice a faster response. new switch: AUTO_SNAPSHOT. If enabled, and a bank is changed via Program Change or within the Bank Submenu, MIDIbox will automatically restore and send the last-saved settings of the new bank. new switch for the motor extension: MF_TOUCH_DETECTION. if enabled, the motor driver and MIDI event OUT handler will notice when a fader is moved manually and react accordingly: If the MIDIbox receives a new value for a fader, manual fader moves will not be sent out for about 1s. If if the touch sensor input is 0V, or a motorfader is moved manually, all incoming values for the currently moved fader will be ignored for about 1s. two new settings for the motordriver have been implemented: Motorfader Speed (0-127) and Mode (Precise or Quick). See the appr. entries in the midibox64.ini file for further details. With these settings you are able to optimize the driver behaviour for the motorfaders you are using. a new motorfader submenu has been added which allows you to play with different speed/mode settings "online". the CONNECTED_POTS setting in the midibox64.ini file allows you to speed up the box if less than 64 pots are connected. Especially users of motorfaders will like this option, because the box will react faster on position changes. Other users will not notify a big change because of the dynamic priorities feature, which also ensures low latencies. SNAPSHOT_AT_POWERON: if enabled, the MIDIbox64 will send the current pot settings when it is switched on. now you have to press the snapshot button in the BankStick submenu longer than 3 seconds in order to avoid unwanted BankStick formats. Users who own a BankStick are able to name the events for every pot in every bank - in this way the display gets more ergonomic. Hexadecimal as well as decimal values can be displayed in addition. Also +/- value ranges are supported. The strings have to be defined within the midibox64.ini file. See the MIDIbox64 Tutorial for some examples. new switch: MIDI_THROUGH_FILTER. should be enabled to avoid MIDI feedback loops. All MIDI events, which are assigned to the pots and buttons will not be forwarded by the MIDI merger. Every BankStick can save up to 16 different setups. Since a standard 32k IIC EEPROM is used, these sweet little things are really cheap (about 5 EUR). So just take one stick for Reaktor, one for Logic (or Cubase/Cakewalk/Sonar/Ableton of course), some for your Synthesizers, etc... :). More infos regarding the BankStick can be found in the MIDIbox64 Tutorial. the SysEx dump structure has been changed again. All settings are configurable now, find the new mk_syx script here. the MIDIbox-to-COM mode can be configured from the MIDI Merger menu. No special firmware is required for this option anymore. Find more infos here. last but not least: the motordriver has been improved; faders are moved much more smoother now. a "MIDI Through Filter" has been implemented for the Motor Extension. This filter has to be enabled within the midibox64.ini file when using motorfaders with Emagic Logic Audio in order to avoid feedback loops. Possibly this filter is also usefull for other MIDI applications. a "Dyanmic Jitter Filter" can be enabled within the midibox64.ini file. It eliminates unstable pot values: slow pot changes will only be processed when they are stable for at least 20 ms (without the filter: ca. 500 us), fast pot changes will be processed immediately (500 us) if the CC value difference is >= 2. Normally this filter is not necessary, but if you notice jitter on the analog inputs and don't find a way to fix the hardware, just try out the software solution. support for +16 additional LEDs (see midibox64_sr.pdf). support for optional motor extension (see midibox64_mf.pdf). More informations regarding this extension which enables you to drive up to 64 Motorfader/Motorpots are available here. Up to 64 motordevices can be connected, the number has to be set in the .ini file (see mk_syx.zip). the LED driver has been improved: every LED can be switched on/off via MIDI with the same event which is triggered by the appropriate button. support for optional +16 Button Extension (see midibox64_sr.pdf). The are full configurable via MIDI Learn or the (new) mk_syx.zip script. support for 4*16 LC Displays. With such a LCD all 64 pot bars are displayed at once (Display Mode 1), the last two sent MIDI events are displayed together with the appropriate pot row (Display Mode 3), the sequencer status is displayed together with the last moved pot and the appropriate row (Display Mode 5). All other display modes are only usefull for 2*16 LCDs. The pot handler have been enhanced in order to achieve a higher flexibility: min and max values are definable for every pot. The CC values are automatically scaled over the whole pot moving range dependent on your settings. That means, if you define a range from $30 to $4F, the value $30 will be sent when the pot is on the left side and the CC value slowly increases up to $4F until the pot reaches the end of the right side. The SysEx Dump structure have been enhanced by min/max entries. See the new mk_syx.pl script at mk_syx.zip. A hyteresis behaviour have been implemented for the Snap mode. With a hysteresis value of 0 the box behaves like before: the pot "snaps" until it exactly reaches the received CC position. With a higher hysteresis the pot snaps in between the hysteresis loop which depends on the pot position and the moving direction. Meta Events allow you to send full customizable (programmable) MIDI data on pot or button movements. With this new feature you are able to send out SysEx strings - or - more than one Note Event with a button - or - mathematical functions over pot values - or -- well -- what you want. Disadvantage: Meta Events are not definable via MIDI Learn, they have to be embedded directly into the firmware. All what you need is the source code of the firmware (available by mail request) and the free MPLAB environment by Microchip. The Meta Event function is isolated from the main code modules and reusable on further releases. Some examples demonstrate the most common cases. Alternatively to the MIDI Learn function the MIDIbox can be configured via MIDI Dump. The new mk_syx.pl script converts a textbased .ini file to a .syx MIDI Dump file. It can be found under http://www.uCApps.de/midibox/mk_syx.zip. the 16 LEDs can be controlled directly via MIDI. To switch off a LED send Bn 77 00 (n is the channel/number of LED, 77 hex = 119 decimal). To switch on a LED send Bn 77 7F. MIDI Learn has been enhanced: every type of MIDI Event (Note On/Off, Controller, Aftertouch, PitchBend, Program Change, ...) can be assigned to the pots and buttons. A different behaviour can be assigned to each button: On/Off Value, On Value, Toggle Value. Two additional display modes have been implemented: "Show last sent MIDI Event and current Pot Row" and "Sequencer Display"
The simple snapshot button has been enhanced to a Save/Recall button. Press the button for one second to save the pot settings, tap it shortly to recall the settings. SysEx Dump of the whole bank setup can be requested and transfered to the MIDIbox64. Note that SysEx transfers to the MIDIbox must have a delay of 10 ms for each byte. The '874 version is frozen and will not be enhanced in the future. First official Beta Release for PIC16F874 and PIC16F877.